If you're looking for small stones that fit in the hand, pocket or purse, this is the place to begin. Often called pocket rocks, these make perfect gifts for groups, meditative tools or even small advertisements. Ranging in size between 1 and 2 inches, your custom stones are available in a variety of options, including stone color, finish, font and fill color. You'll have room for a word or two, brief text or simple image. Looking to add more but keep the small pocket size? We can add engraving to the backside as well as the front. 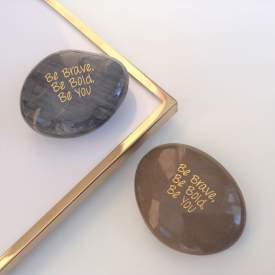 We offer quick ship, in-stock options for when you're in a hurry or need engraved stones with inspirational words.